I admit it. I really miss last basketball season. I understand that this year is a re-building period, and I think it will be ok in the long run, but sometimes it's hard when it seems like no one on the team can knock down a shot for a million bucks. I'm still hopeful, but it's a sad reality that we may not even make it to the big dance in March. So, during this year with all-too-frequent moments of despair, let's remember the good times. In my nostalgia, I have compiled a list of my top ten games from last season. Some went unrecognized, others are still talked about all the time. But none of these events should go un-watched. Chicago State: This game was sparsely attended because it came right after a home football game, but it was a lot of fun. 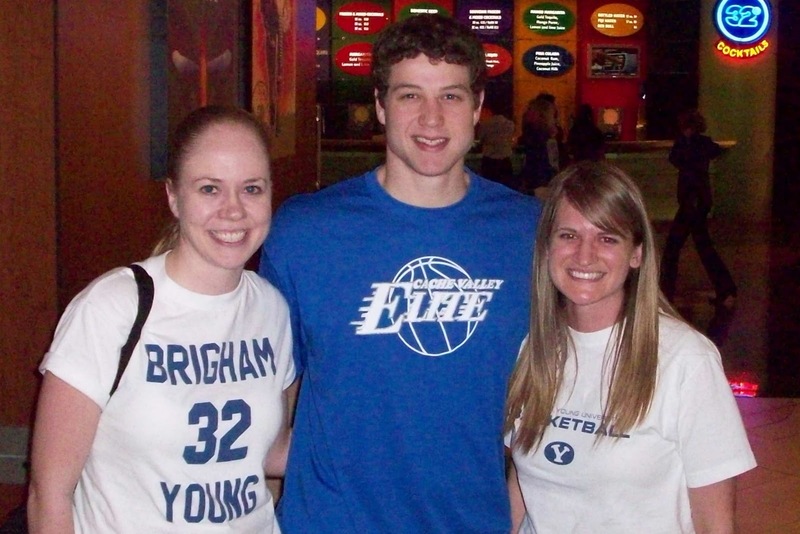 What I remember the most was a good old-fashioned thrashing of the opponent and the first time I ever saw Jimmer dunk. UNLV (Both in Provo and in Las Vegas): "What you talkin' bout, Willis?" Our first sweep of the Rebels in way too many years-- "Woah, how far out was that?" "It was at the edge of the V in UNLV!" I also got this sweet shot of Jackson dunking during the home game. Colorado State (in Ft. Collins): Jimmer is about to pull up from long range and one commentator says, "No way!" It's nothing but net. Then comes laughter, followed by a sullen "I'm going home." TCU (in Provo): Jackson Emery night. Glad he got his own moment in the spotlight. 10. UTEP: This game was electric. BYU was struggling for a little while at the beginning, but then someone plowed right through Jimmer with no foul called, and that set him off on a scoring streak, culminating in his second (and last) successful dunk of the season and the crowd chanting, "Just like football! Just like football!" in honor of the recent New Mexico Bowl. 9. Fresno State: First regular-season game. The first of many where everyone was packed in like sardines and screamed their heads off. The beginning of a fabulous season. 8. Wyoming (in Provo): Senior night was great. We came back after a demoralizing defeat from New Mexico and got our first, much-needed victory without Brandon Davies. It was also really fun to be a part of the student section flash mob and watch Jimmer, Jackson, and Logan receive well-deserved standing ovations. 7. Utah State: Those Aggies really get on my nerves. They don't seem to notice that BYU doesn't care about them or think of them as a major rival... basically they just hate the Cougars for no reason. There were a lot of USU fans there, and watching their jaws drop as their team got Jimmered was priceless. 6. Arizona: I had great seats for this game at Energy Solutions Arena, and it was awesome. Derrick Williams got cocky as usual and saluted the student section after a slam dunk, but then was cowered into submission by the Jimmer. Not quite the 49-point fiesta from the year before, but a rather "respectable" 33. Take that, future number two NBA draft pick! 5. Vermont (in Glens Falls): Jimmer's home town game. It was awesome to see him in his element and be able to interact with all the people who watched him grow up. The really long standing ovation when he was introduced was definitely something special. 4. Utah (in Salt Lake City): Arguably the best half of basketball ever played. Greg Wrubell says it all: "Jimmer from 40 feet... GOT IT!!! HE GOT IT!!!" As Jimmer walked off the court, he rubbed his fingers together ("money") and one of the commentators later interpreted that to mean: "Yep, I'm Jimmer. That's what I do." 3. SDSU (in San Diego): Almost nobody thought they could do it twice. But yes, despite the fake missionaries, Whitney-taunting on Facebook, celebrity cardboard heads bobbing up and down, and profanity constantly being shouted from the stands, SDSU got Jimmered yet again, on their home turf. It led to a #3 national ranking for the Cougs. 2. New Mexico (in Las Vegas): Jimmer's 52-point thrashing of New Mexico in the MWC tourney was AMAZING. It was totally worth the money and the long drive down there just for that 2-hour block of time. It was awesome to hear everyone (mostly drunken men, somewhat ironically) shouting "Yeah, I love Jimmer!" at my roommate Traci and I as we walked down the Vegas strip in our BYU t-shirts. The night before this game, we ran into the Jimmer at the MGM Grand food court. We got to chat with him for a minute and got a picture taken. I like to think that meeting his biggest fan again (me, of course) was just the motivation he needed to whoop those pesky Lobos. 1. SDSU (in Provo): I have never been in an atmosphere quite like that before, nor will I ever again. I thought the Marriott Center was going to explode. We couldn't even hear the whistle. My friends and I went 5 hours early to wait in line in the freezing cold, and still ended up about 10 rows from the top of the stands. But it was incredible. This is the moment when Jimmermania truly began. I felt bad for the guy as he almost got trampled by the students rushing the court. But it was a great moment-- one I will never forget. The Marriott Center during the SDSU Game on January 26, 2011. Best. Game. Ever.